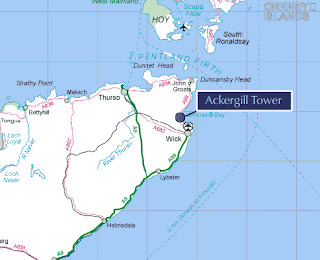 "Money a mickle maks a muckle"
but will it be enough to buy Scotland's Ackergill Tower? GBP £5,000,000 (8.2 million American). A Realtor's ® dream! 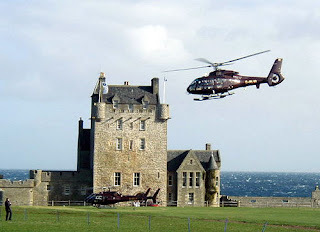 Ackergill Tower is just five minutes from Wick Airport which now benefits from multiple no frills scheduled flights into Aberdeen, Edinburgh or Inverness and then on to Wick with either Flybe/Loganair from Edinburgh or with Eastern Airways from Aberdeen. Depart from London Heathrow via Edinburgh at 08:00 and be here in plenty of time for lunch, and when you leave Wick at 12:00 you will be back in Heathrow at 17:20. 15 she jumped to her death from the battlements of the tower. 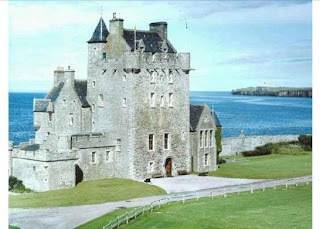 Ackergill Tower, a historic estate dating to 1476, is on Sinclair’s Bay in the northeast corner of the Scottish Highlands. It was expanded significantly around 1850.The estate is three miles from the town of Wick, where there are shops and an airport, and approximately 105 miles north of Inverness, which is known informally as the capital of the Scottish Highlands. WHO BUYS IN THE HIGHLANDS? Among non-Scottish buyers, the English are the most common, followed by other Europeans. states Reg MacDonald, the regional director of Re/Max Scotland. Fit Like? - An Aberdeen greeting, meaning how are you? Dinnae fash yersel - Don't trouble yourself. You're a long time deid - Enjoy life now. A dinna ken - I don't know. Do you love a good history lesson? 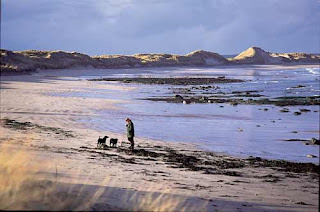 Read about the great sand heist of Ackergill at odd.scotland.com. Fascinating story of the the beach being ancient burial grounds for the Vikings. 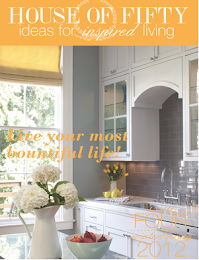 Want to test sleep before you buy? 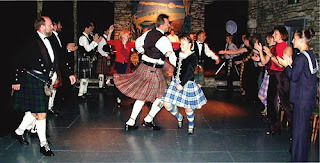 Stay a wee whiley at the edge of the sea; rates and information are found here. 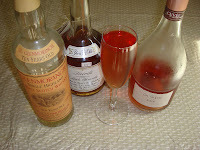 Pour Glenmorangie and apple brandy into a flute glass, then add in Rose Champagne to fill. Delicious! 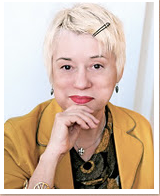 JennieMac from letshaveacocktail.blogspot was incredibly kind to honor me with this clever award on Sunday. Her one request was for the receivers of her award were to pass on a cocktail recipe and join in the party. I hope you will give the champagne Scottish apple romance a try and visit Jennie's hilarious blog. She has a way with whit like non other. Deb-I'll live in the tree house. Dt: I'll join SR2, but she probably needs the whole tree house for her vast collection of accessories! Thanks for reminding me of the Old Country! If I had a spare 10 mil I would totally buy it! ...5 miles of sandy beach and a moat...I'm there. Gorgeous, if only I had the cash to spare! I'm hoping to go to the Highlands next year with Dave; if we do go, I'll have to swing by Ackergill and see it for myself! Wow - what a gorgeous estate with such an interesting history! Let's all put our pennies together and snap it up! ha! Loved this post! Oh Deb, thanks so much for letting me know that this castle is up for sale. I'm off to Scotland with £5 million in my pocket, to buy it as my holiday home!!! !....I WISH. If only I could win the Lottery. Amazing! 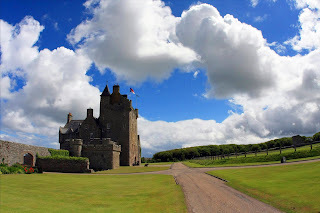 My husband's family is Scottish- I am pretty sure that we cannot live without this castle ;). Great post! Thanks for the history lesson! Loved it..and by the way...I wouldn't mind being the host of ghost. Great post..very funny too! Oh my Lordy, what a post. Bit gobsmacked actually. Bit sad about the ghost. It looks totally amazing. Thanks so much for all the info and the drink to wet the whistle. Yeah, I wouldn't mind staying there, but I might have a bit of a cash-flow problem if I attempted to pay for it ;-) Love the fact it comes with its own opera house! For now, I'll have to be happy of our 2nd home in the center of Scotland ;-) Hope you're having a great week so far! Looks like castle heaven. I love the way it's been modernised so beautifully but still retains its medieval magic. 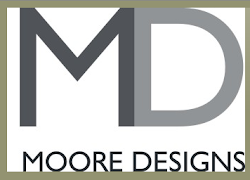 Great post - thank you! If I had a spare $8 million, I'd be tempted!! ;-) The location is awesome -- I'd love to wake up and look through the window and out over the water every morning. And I like the idea of having no neighbours!! now that's a home i can wrap my head around. wouldn't it be a dream to live there ???? 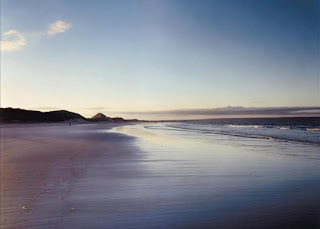 its gorgeous..and we have an affinity for Scotland..my maternal grandparents were born there...and I grew up Highland Dancing and all my uncles etc play the pipes! Maybe I should buy this abode! You certainly do give good blog!! Sorry I am late... i think you know why.. something to do with naughty mother nature and there may be more coming our way! Well I love everything about this! and that is also going to be my new saying!! I've been working on my 'muckle' for a while now but doubt it is going to get me this beauty!! Remind me, why can't we all live like this? 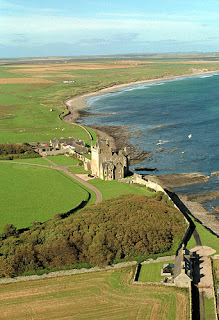 Yeah, would love to own a Scottish castle! 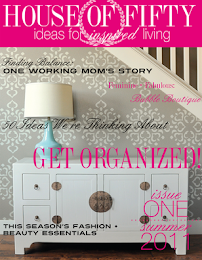 Gorgeous post, darling! I need a Scottish castle stat! Can I just buy the tree house??? That looks so cool!!!! PS - Just gave you an award on Odi et Amo today -- stop by and pick it up! Oh! I want the castle!! Hello darling, fit like. (I hope this is correct.) Darling have a lovely weekend. 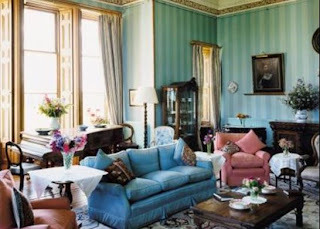 fascinating post -- loved reading about the history of this amazing castle and catching a glimpse of its expansive interiors -- and the recipe for champagne scottish apple romance was the perfect way to end things!